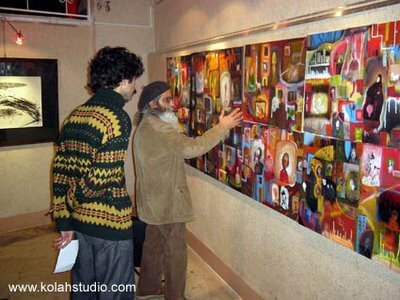 “For the graphic arts in Iran, whose history reaches back to the second half of the Nineteenth Century, the wall ad or poster is a new feature. 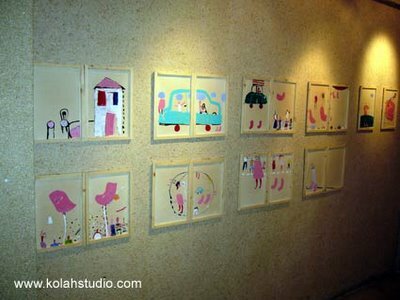 Before, our graphic arts were comprised chiefly of calligraphy, book illustration, signage, caricature and illustration. These elements formed the pillars of our graphic arts in the past. 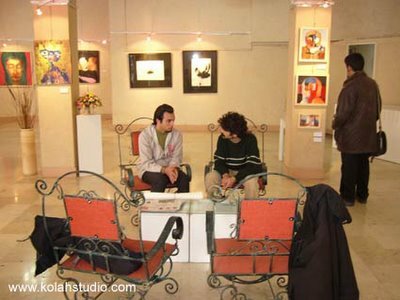 “Before Momayez there was plenty of unbalances and complexity in Iranian Graphic art and there was absolutely nothing called “Logo “ in Iran ,before him”said Aidin Aghdashlou,Iranian Master Painter” It was Morteza Momayez , Ghobad Shiva and Farshid Methghali who made life to Iranian Poster Art” He continues.The Fact is That Momatyez approaches are worthy because of his success in making a true path for the Iranian young Talent. Beside Graphic design and the long way he has passed true his Art life ,Momayez Has a Film making Experiments : 3 short films – Flying Black , “those who act and Those who dream” & “One green Point”which has won the 1973 Moscow Film Festival Award. 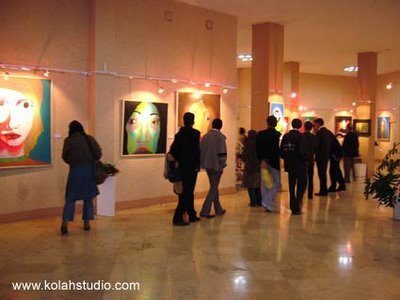 The First Group Exhibition of Kolahstudio Artists is Now open for Public from 12 November 2005 and will be continued Until 17 November in Behzad Art Gallery ,Teheran,IRAN. Karan Reshad –Kolahstudio Former and Manager- aims to break the silence taking Iranian Desperate young Artists and Invite them to Exhibit their works for Iranian People. The main Atmosphere in which the exhibition is stable is the Expression. Expression of The inner and The fact of Being true nomatter what the situation. Kolahstudio Has selected 4 artists from among ten Artists to include their works for November 2005 Exhibition.Kaveh Tavakoli, Ismaeel Bahrani and Arash Khodaee are showing their works beside Karan Reshad in a Great Exhibition space on Keshavars Blvd. 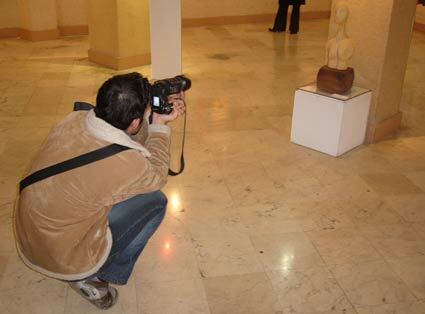 Tehran. 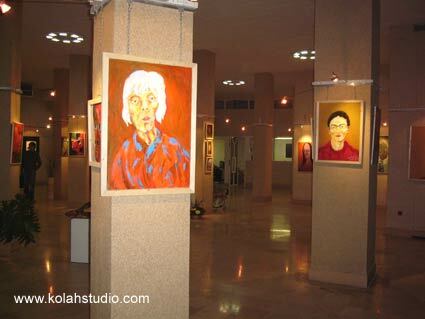 5 figurative ,wood sculptures , 2 children illustration books and more that 100 Works of Expressionism Art are ready for people to visit in The First kolahstdio Exhibition. The 7th Tehran International Cartoon Biennale is now open for public to visit Cartoons from participating Cartoonists around the world. 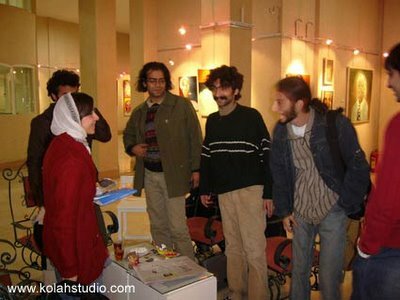 it is not as well as previous biennales but it's acceptable with names like " Kyoumars Kyasat" , "Ares" and "Kambiz Derambakhsh"
The Painting exhibition of Afshin Pirhashemi , The Iranian Young Painter who has justly won the second prize for his painting -Women- in China Biennale 2005 is Now open at Seyhoun Art gallery in Tehran. 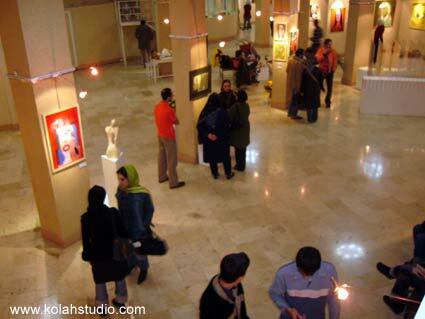 the Exhibition would continue till 11 November 2005 . Big canvases of Mostly black and white Images made of an Abstract Atmospheres taking Realistic figures and portraits inside. Maybe it’s not false to say that One good aspect of Mr.pirhashemi’s Paintings is the right usage of Abstract Expressionism achievements in making his backgrounds and limiting his works to a condition of semi Drawing/semi Painting. 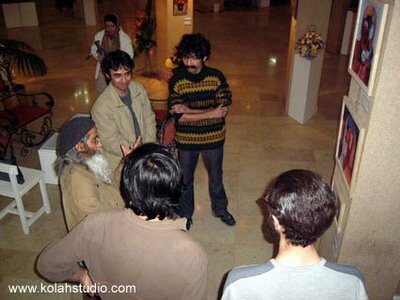 The symbolism of Candles and some gothic themes beside a deep influence of Christianity and- Shocking in this Exhibition- an Islamic Hand symbol is Mostly appearing in Afshin pirhashemi’s Paintings and that’s a point we can’t see it’s reason ,yet. The Group painting Exhibition of 6 Iranian Painters is about To end At Laleh art Gallery Tehran.